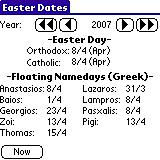 Calculates and displays the Easter date for the Catholic and Orthodox Easter. In addition, it calculates the major Greek floating name-days. I never got around adding support for the built-in calendar though, although I might if I get the time.